Its been a slow, painful process but at last there has been noticeable (just barely) progress on cleaning up. The issue of what exactly to do with miscellaneous surplus-to-requirements not-very-sale-able or even give-away-able soldiers, books and rules is a puzzler which is still tying up valuable space but I can work around that till various schemes come to fruition over the next year. (At which point drastic and terminal action may have to be taken). However, it hasn't been all destruction. I have also slightly expanded available shelving by rearranging things and getting innovative and I am working on more. There are some hard choices here too, wall space tentatively marked for prints to be framed and hung are likely to end up covered in shelves unless something changes but here too an alternative is being experimented with, non-conventional mounting on thin boards screwed to the sloping ceiling instead of framing and hanging. Not as good but vertical, non-window & door spaces in this old house are at an extreme premium and some of these prints have been waiting nearly 30 years for me to have a place to display them. I have also been working on having multiple dice, tape and game-marker stations, handy to both sides of the table and not located under a table cloth like the current one. With these will come several, easy to reach, Casualty Clearing Stations where casualties can be placed when playing single figure games. These should help ease the post game clean up issues surrounding single figures. Tackling the waist high crawl in, under the eaves, cupboard is next. If there are no further blog posts, you'll be able to guess what my fate has been. In the light of increased unrest in NkuKhuland the Government announced that it was going to reinforce the existing garrisons which guard the borders. When war looms there is one man that the public clamors for and graciously, Colonel MacDuff came out of retirement to lead the expedition to Fort Belmont. Our correspondent accompanied the column and sent this report. The column easily repulses the first NkuKhu attack. It was on the morning of the 26th of May that the column broke camp and started on the last leg of our journey. No sign had been seen of the enemy but our scouts assured us that one rarely saw any signs of the Nku Khu until their war cry broke the air. The wily veteran MacDuff, with his faithful hound and his piper by his side, was an old hand at this sort of thing and took no chances. A company of the Black Watch marched on either side of the wagons, a troop of Light Dragoons rode at the head and tail of the column and 3 scouts beat the bushes along the road just in front of the wagon. We had just come to Tsentral Ridge, a low but rugged eminence from which one gets the first view of Fort Belmont, when the first shots rang out and we heard that awful cry. Nku! Nku! Nku! Khu! From out of now where hundreds of black warriors came bounding across the Veldt, clashing their spears on their shields while bullets whistled about our ears. (ed. According to official sources, the first attack was made by about 24 spearmen supported by 16 riflemen with obsolete trade firearms). The din was horrific and time short but 'A' company of the Watch and the scouts opened a hot fire bringing the enemy to a halt, then the Lt Dragoons trotted forward, wheeled and charged, driving the enemy back in rout. Looking about I saw the wagons pushing on like nothing had happened. From the top of the ridge, a squadron of lancers could be seen trotting forward to meet us while the cannon boomed a welcome. No new enemy was in sight. In looked like we were home clear. The road to Fort Belmont looks clear. I should have known it was too good to be true, as the wagons edged down off the ridge, more warriors arose from the long grass on either side of the valley and rushed forward while bullets flew about our ears again. As the savages burst from the grass ahead of us, the lancers wheeled to meet them. That's it for you my lads, I thought and quick as a flash the whole lot was heading pell mell for the brush. Splendid! But surely they aren't going in after them? very one knows that the Nku Khu warrior in retreat is like a wounded lion and the brush and gully his lair! The bugle sounded recall, over and over with a desperate edge to the notes but the cavalry had the bit between their teeth and there was no stopping them. Into the brush they went, but only 1 came back out. If there were any more of the heathens in that brush, there was no one between them and the wagons! Turning, I could see MacDuff bellowing orders to 'B' company but engaged in a hot firefight, his voice went unheard. On the hill far to the rear, I could see a fresh horde approaching. Something looked familiar about them, using my field glasses, I studied them, could these be the famed zombie warriors raised from the dead? Surely that was a camp fire story only? (ed. No one has ever been able to disprove stories that Nku Khu warriors that are killed early on in a battle often reappear as reinforcing units.) The Light Dragoons spurred forward and easily chased them off the plain and into the hills. Alas, it was yet another trap for the inexperienced troopers. From the fort, the gun boomed, again, and again as new targets emerged. As I watched in awe, the veterans of 'A' company doubled past me heading for the wagons. Beyond the wagons, the last troop of lancers from the fort tried gamely to cover all angles. As a fresh company burst from the woods, the three lancers spurred to meet them. This time, despite the impetus of their charge, which made them worth double any man on foot by the usual rules of war, failed to impress and they sank like a stone in the wave of black and white. On rushed the triumphant Nku Khu, the QM stepped forward to halt them and demand proper forms but he went down with an Assagai in the belly. Bloody disaster stared the column in the face. 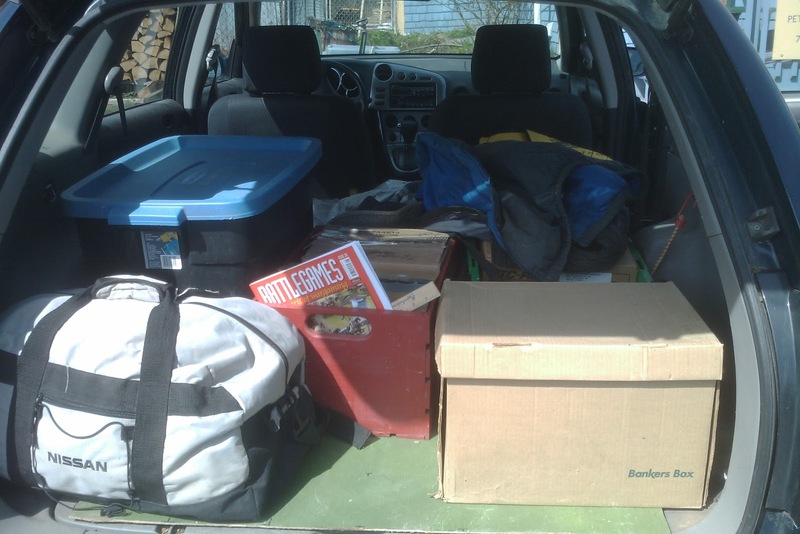 Desperate struggle around the wagons. The dying QM struggles to complete his list of deficiencies. Onward surged the warriors, drunk on blood, but the stern men of the 42nd matched them. No time for shooting, it was bayonet vs Assagai or knobkerry and the Nku Khu were no match for our Highlanders. As the enemy tried to rally for one last charge, MacDuff led 'B' company forward. The cannon boomed again and a fierce Martini Henry fire crackled up and down the line. Caught in the open the warriors went down like wheat before hail. 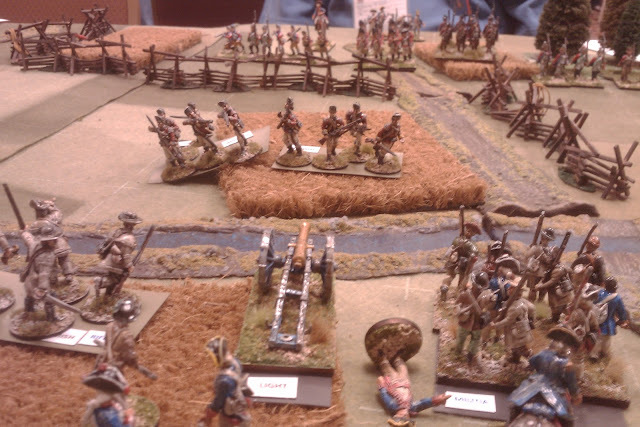 The remainder slunk into cover, pausing now and then to wave defiance as the remaining wagon trundled into the fort. The rebel Nku Khu have been dealt a terrible blow but it was not without cost. It may be possible to rescue some of the supplies from the wagon that was over run but only 1/2 the planned stores have made it and heavy losses amongst men and horses in the cavalry will make it impossible to field more than 1 troop from the original 4. The Colonial Council had best authorize speedy and powerful reinforcements if they wish to avoid a long and even more costly war. The remains of the column win through. 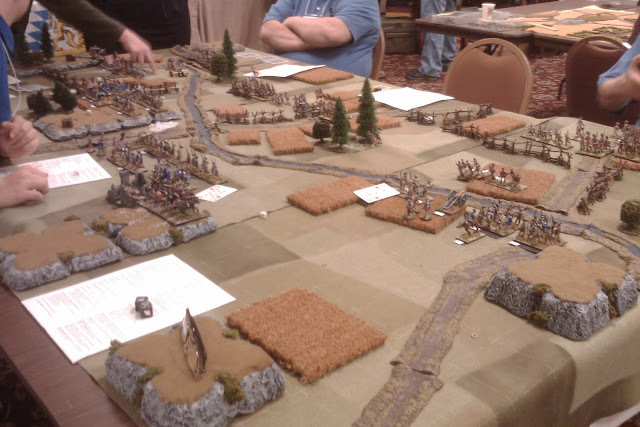 The scenario was the Wagon Train from CS Grant's Scenarios for Wargames. For the Imperial player, the units were composed of 6 regular infantry with breechloaders or 3 irregular light infantry or 3 cavalry, or 1 gun and crew. For the Native player, units were of 12 spearmen or 6 riflemen using inferior rifles. Since I didn't have enough units, I recycled casualties to make up the missing units and brought them on late in the game. It's Saturday, its cloudy with rain any time now (come on rain), its been weeks since I had my toys out and I was tired of thinking about Colonial wargames, it was time for a game. My 40's aren't ready, I was going to be using the old rules, it just made sense to break out the old figures. 1. I need to stop breaking out the old 54mm Colonials unless I want to get side tracked into fixing up chipped paint, dropped shields, etc adding some more Zulus, mounted rifles, infantry in sun helmets, fixing wagons etc etc......, essentially duplicating this project in 2 scales or replacing the planned 40mm version which fits the table better and will look just as good once done. I try never to have regrets about roads taken or not taken but its hard not to reflect on what my collection would be like if I had stuck to my original plan of Soldier Pac recasts and Dorset toy soldiers and not been decoyed into modern plastics. The Newport Noodle does not cover events in Nku khuland so I've had to wire the information to the New Durban Times which has not been published in a decade. They should have the presses dusted off and a report up by tomorrow but in the meantime I'll present my thoughts on the game and where I want to go with all this now. The Quarter Master Sergeant presenting Colonel MacDuff with a list of Deficiencies while a scout tries to draw their attention to a more immediate problem. I'll try not to give away too much detail about this squeeker of a game but it was a MacDuff game of the old vintage that I have such fond memories of from the turn of the century (if I can use that phrase without feeling too pompous). For some reason, the combination of setting and real toy soldiers seems to strip away all that silly nonsense about fixed time and ground scales and relationships between what real life activities can be done in a certain amount of time vs what can be done in a game turn. I still find it odd that violating those things often makes the game feel more real, but I'd best leave trying to explain that to some student of psychology, philosophy and game theory. I did find myself slipping back into some old MacDuff habits, but after all, the Colonial MacDuff was the original version. I've played more F&IW and 1812 games than Colonial ones but the rules were written for the Sudan, Zulu Wars, NW Frontier and in hopes of one day doing the Indian Mutiny, the earlier stuff was a later adaptation. That said, there was lots about the current version that worked better than the original and once I settled in, I didn't really miss the variable moves or multiple command levels. The simpler control/orders chart is better but I think the game would benefit from an optional subordinate personality rule for solo or 2 player games. It also seems to me that I was fudging the orders aka Control chart a bit as I went and I think it needs some work for the wider time period and wider selection of troop types. I may be asking too much of it and may need a separate chart for things like "should this cavalry unit pursue against orders". Basically same test chart but different results depending on the situation, if that makes any sense. Its about layout and clarity as much as anything, avoiding strings of conditional clauses, exceptions and modifiers as much as possible. Anyway, I am now chuffed to start a slow careful editing and lay out of MacDuff to cover the whole time period with the rules laid out in a clear, easy to understand fashion with examples and illustrations. This may be seamless or it may be a matter of basic/introductory core rules and campaign/special rules + design notes. Brevity and timeliness will not be primary aims this time around, a finished "product" that I can stand behind and leave alone will be. It was around 1992 that I started working on "With Fire & Sword in the Sudan" which became "With MacDuff to the Frontier" a year or 2 later when I added other campaigns. Time to finish the job. Fort Belmont, defended by 90 year old veterans including an example of just the sort of field gun that I need for my 40's only I need it one size smaller. Britain's did make just such a thing for their W & B series, I've just never seen one in the flesh. I should have listened to MacDuff. First off an apology to anyone chasing a ghost post from earlier today. I had posted an early draft of a set of Colonial rules but it fared so poorly in preliminary testing that I have decided to drop it. I was going to leave the post up as a point of discussion but to avoid confusion, I have decided to just pull it. After some more testing of quite different ideas, none of which were quite right. It belatedly occurred to me to try the current version of MacDuff as it is supposed to work up to the 1880's. Yup. It worked just fine once I added back the Prone rule that seems to have gone missing and made a slight tweak to the Orders Check to make units under fire pay the penalty. I'm not sure yet if that will be a general tweak or a late 19thC one. Every thing else worked fine. Next step, sometime this weekend will probably be an Nku khu ambush of a British supply train. Archive footage of an earlier clash between British & Nkh Khu from 2 years ago. This is not a new topic for me let alone for war gaming at large but a couple of things have come together just as I contemplate rules and game-style for my late 19thC Colonial games and made it important for me to revisit the topic. No one doubts that men are killed and wounded in battle, that's sort of the point of shooting and stabbing people but there is debate over what the relationship is between casualties and unit effectiveness and behaviour. I entered the hobby in the early '70's when the mainstream view can be summed up by saying that in most current rules, combat results and morale were largely casualty driven, not entirely but largely. I remember in the '80s, reseaching to try to determine just how many casualties it usually took to force a French column or a British line to retreat. Over time though, the more I read, both history and theory, new and old, and especially the more 1st person accounts I read, the less I believed in this approach. Unfortunately, at about the same time, I began discovering my inner "Toy Soldier guy". The catch then has been finding something that was simple, gave what I felt were reasonably historical results, for the right reasons but felt still felt sufficiently toys soliderish (whatever that is) to satisfy as a game. To greatly simply my view on combat results to a "sound byte" level, essentially, it now seems to me that while numbers are not irrelevant, and few units ever fight to the last man, combat across the last 3,000 years can be divided into two primary if vague categories: Non-decisive Shooting and Shock Attacks. Essentially firepower, including skirmish fire and artillery, used at effective ranges can be used to weaken an opponent but not usually to over power him. If the enemy is well disciplined or well protected, he will generally be very resistant and even a prolonged drain of casualties will generally not significantly weaken the defence unless casualties are very high, in the order of 50% or more. An example might be one where infantry are caught up on wire and cut up by machine guns and shrapnel. Shooting can, however, pin the enemy, occupy his attention or drive him to cover and can sometimes encourage his leaders to pull him back, often with a fatal collapse of discipline if the troops are poorly trained or demoralized. We can see this in play from Cyrus's fight against the Saka where both sides shot their bows until the arrows ran out then closed to hand to hand, to contemporary warfare. Shock Attacks on the other hand, almost always result in one side or the other being forced to retreat, often being done for the day. Now, by attack, I don't necessarily mean fisticuffs. Sometimes it is fire power deployed with great effect from inside the enemy's comfort zone, like the British Guards at Fontenoy or an assault with grenades and flamethrowers on a bunker. In all these cases, casualties are involved but it now seems to me that units don't seem to weaken in a linear fashion in direct relationship to the number of casualties. Its more like sawing a piece of wood, if you saw 1/2 way through, the wood still holds together and you still can't break it by hand, you need to apply almost as much force as when it was untouched. The sawing,obviously is the shooting, the pressure, the assault. In wargame terms, you can capture some of this by OS methods of incremental casualties but it only really works well if you have large units that allow you to accumulate low numbers of casualties over a long period of time and don't allow odd morale test results to interfere unduly. When I first played DBA, I was somewhat put off by die/don't die combat results but I'm slowly coming to think that they are more right than wrong, even if I don't desire to copy the methods. Morschauser actually captured this divide fairly well, especially if using the roster system. The fire combat is still a bit too deadly perhaps but it can be a slow and unpredictable business trying to defeat an enemy by fire. An assault on the other hand (3" melee range) is deadly as it continues immediately until 1 side or the other is eliminated, a little too harsh perhaps. All of this went into Hearts of Tin and MacDuff so why bring it up again? Simply put, for some reason, I was expecting the Boer War to be different! However, after reading Rietz's memoirs and dipping back into some other books I haven't read in a while, it all still seems to apply. That's why even in the 3rd year of the war you could still find the Boers making mounted charges on British camps or foot assaults on defended positions. (I was beginning to think that these sorts of things were dreamt up by the illustrators!) They dind't happen often because the Boer's weren't often interested in taking a position away from the British, but when they needed supplies or their escape route was blocked, sometimes there was no choice and crack shots or not, there was only one way to take the British out, an attack. Some other interesting tidbits picked up were that effective rifle fire often began at ranges where Rietz felt that aimed fire was impossible, distances like 500 or 800 yards. So much for Boers picking flies off a Brit's nose at 1,000 yards. He also noted that many of the British shot fairly well themselves. It was only at quite close ranges that the real Veldt Boers became so much more deadly. But even here it was more a matter of pinning and killing/wounding a few men than of breaking units. 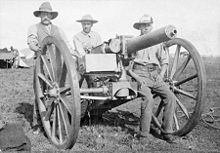 British artillery fire could occasionally dislodge the Boers if they felt like there was nothing to gain by taking the casualties but the only thing that could dislodge them if they felt they needed to hold the ground, was a bayonet charge from close range.. The same concepts seem to also apply against more "savage" enemies, Pathans and so on, the constant sniping took its toll but it still needed a charge with Cold Steel to clinch the matter for one side or the other. So, turning to my Colonial games, my vague plan was to use small units of single figures being treated as individuals for the spirit of it but any system that inflicts casualties and then uses that to establish a units fighting ability, is not going to feel right, especially when each hit is a 10% or even 25% casualty rate. I contemplated switching to a 1 base=1 unit system with fire usually giving pin or retire results, and close combats giving a destroyed or repulsed result, but, that's not the game I was intending to play. So I need to find away using the toy soldiers to have fire have an effect, possibly cumulative, without it killing a lot of guys. Movement should be long unless interrupted by being shot at. Fire against close order targets should cause casualties, against skirmishers and troops in cover, it should tend to pin rather than kill except at very,very close ranges or if by some sorts of artillery in some sorts of terrain. The decisive charge should be able to fall back on the traditional figure vs figure roll off melee, if the charge get home. Any idea of constant scale is out the window. To fit the typical sort of small action onto my table, I would need a ground scale of around 1"=100 yards. Each of my figures would then represent around 100 men. That's battalions in battle, not a few companies in a skirmish. Time is also an issue, the important bits happen quickly but desultory exchanges of fire can last hours. I think its time to adopt the time, distance and troop scale concepts from Charge! again. It all needs more thought and some putzing about on table, but first I need suitable troops to putz with!. Making maps reminds me of making scenery. Once made, I appreciate them but making them is tedium not fun. Once again I wonder if I'm not all that good at because I don't enjoy it or if I don't like doing them because I'm not all that good? However, the entire island has now been mapped in usable fashion. It is with a touch of chagrin that I note that the older map seems much more attractive to me, and that if I had just looked at it first and plotted the new map on the computer, both halves would have matched. I may redraw them at some future point, but somehow I hate to think of myself as that bored. A little touch up perhaps, on a winter's night. 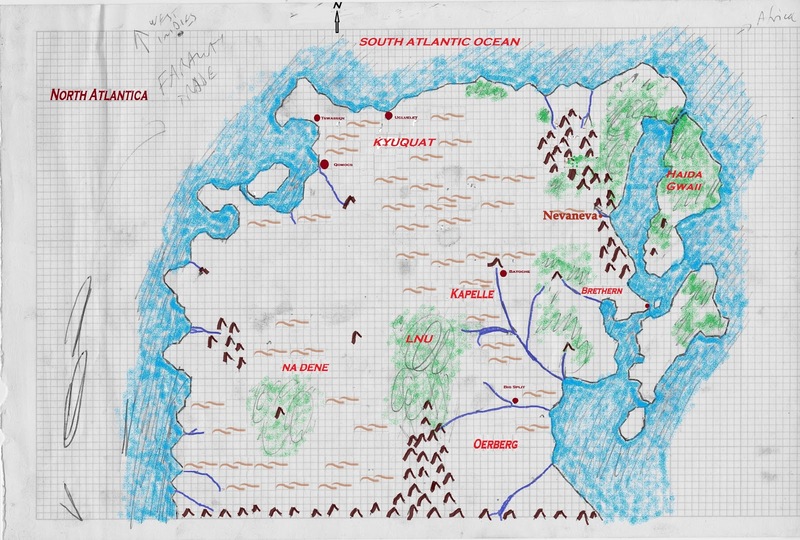 It is also with chagrin that I see that, while both maps were originally plotted on graph paper using Henry Hyde's Battlegames article as a terraforming guide, I managed, somehow, to remove the grid from the southern half. This suggests that perhaps I didn't plan to use it for actual campaigns when I drew it some 5 years ago? At any rate, as displayed the maps below are at slightly different scales but at 1:1 the width of the 2 maps is equal where the mountains divide the continent. The original intended scale was 1 grid sq=10 miles but since this gave me a mini-continent twice the size of Madagascar, going unnoticed by history while being fought over by armies of a few thousand men at best, I have shrunk it to 1 grid square = 1 mile giving a total area for the island of something like 7,000 sq miles. That's about 3/4 the size of Sicily. Not the vast spaces I originally envisaged but big enough for my purposes and much more reasonable to be missed from the pages of history and it makes the map more relevent for laying out a wargames table and for campaigning. It also helps explain the coziness of the 2 sides to date, the small numbers of Imperial troops and the upcoming cultural similarities of the various Atlantican tribes. Working out economics and the like (yawnnnn) has been beyond my enthusiasm levels to date. As long as there is enough lead & tin for toy soldiers and a few bits of wood and lichen for terrain, what more could an island want? Northern Atlantica. The chief native Atlantican power is Kyuquat in the north. Kapelle is technically a satellite of Kyuquat but is largely independent and contains a large percentage of people of mixed race. Oerberg in the south-east was formed during the mid 19thC by immigrants, largely from Oberhilse. 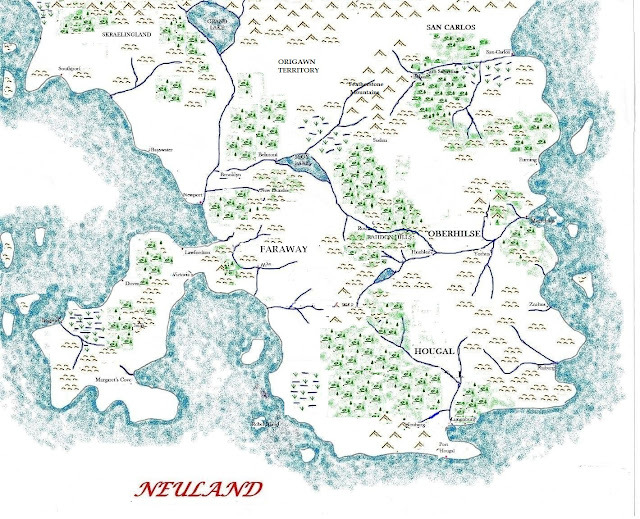 South Atlantica (Neuland was the old name used by the first Europeans) The chief powers are Faraway and Oberhilse. Next up some thoughts on the look and shape of upcoming Colonial games. A look ahead wile the map is being fixed. I was setting about a post including a sketch of the geography and political situation north of the mountains when I noticed that the map of the southern half was only 75% fixed, some names and mountains etc still being upside down. Hopefully I will complete repairs and load them tomorrow. I notice that the older map is somwhat prettier than the new one but I'm not about to fix it, yet. Both maps were initially sketched out using Henry Hyde's article in BG 3. I've said before that I have no interest in learning or inventing languages so have borrowed heavily on some familiar names, at least Jeff and a few others will recognize some of them, even if a letter or 2 is changed. Its hard to completely plan out campaigns when the history hasn't been discovered yet, but I have enough plotted out for now to allow me to get on with some figure painting and game planning. There is no denying that by the end of the first decade of the 20thC, modern warfare had come to Atlantica with its panoply of heavy guns, machines, drab uniforms and trenches but I have decided that I don't need to deal with all that just yet. Certainly not when the last half of the 19thC has yet to be dealt with. In the future? Well, we'll see., for now I just want to get back to some "Colonial" games. I can't deal with all the wars of this busy little island in one go but aim to tackle at least some aspects of the following campaigns this year. Please excuse the sparsity of details, in some cases even the participants are unclear let alone the years and outcome. The names and geographic relations will be clearer when the map and survey are posted. The various Haida Gwaii Wars fought during the 1850's and 60's, mostly by the FTC supported by Faraway vs the Haida from the heavily wooded, swamp islands of the North East, and against the Brotherhood who were based on the mainland behind the islands and were allied to the Haida. The Oerberg settlers had little to do with the Haida but also came to blows with the Brethren several times. Officially these campaigns were a response to piracy but that included a refusal by the Brethren to acknowledge claims or grants of monopoly or borders. This ended of course with the fall of their coastal strongholds and the Long Ride into the interior. The Sasparilla War fought by the FTC supported by the Crown against Kyuquat in the 1860's and which eventually led to the disolution of the FTC and the assumption of its interests by the Crown. Kyuquat being the primary independent Atlantican state having cities and regular troops. The Kapelle Valley War fought in the 1880's. The various Dene Wars fought by the Dene clans of the plains and later their Brethren Allies, surreptitiously supported by Kyuquat against any interlopers including settlers from Oerberg and their own sometimes friend and ally, the FTC. These would eventually be the longest and most prolonged series of campaigns, stretching into the next century. These various campaigns were fought as smooth bore muzzle loaders gave way, first, to muzzle loading rifles then breach loading weapons for both small arms and artillery. They were also fought from the home bases of the armies of Oberhilse and Faraway. Much reliance was placed on local volunteers and the full glamour of smart parade uniforms was a rare sight. We have already seen the shell jackets and Havelocks worn by Faraway units and the sky blue denim fatigue uniforms worn by the Oberhilse Field Force. As the century progressed, these sorts of adaptations kept pace with the evolution of home service uniforms and included various items as sun helmets, cap covers, wide brimmed "campaign" or "wide awake" hats, leggings to keep the dust out of boots, the replacement of bright white belts, a reduction in shiny brass and often, the adoption of locally acquired clothing. Victoria Day, the real start of summer. An old parade photo trotted out to celebrate the day. In 1845 the parliament of Canada declared May 24th to be the official birthday of the reigning monarch, Queen Victoria. It was renamed Victoria Day at her death but continued to be celebrated as the reigning monarch's official birthday. In 1952 with perhaps more practicality than sentimentality the day was switched to the last Monday before the 25th of May. Within my lifetime, despite the patriotic firework displays that one used to see, what the Victoria Day weekend really celebrates is the beginning of summer. Gardens are planted, cottages opened along with campgrounds, historic sites, public parks and so on. I'm not sure how many Canadians today have at least a foggy idea of where Victoria Day got its name but how can you argue with a holiday to celebrate the start of summer after a Canadian winter? A hearty Happy Birthday to HM and let the summer begin! When I included the full dress bugler of the Blue Guards in the picture, my intention was merely to show past practice but thinking about it, the tradition of full dress British toy soldiers in Little Wars, the popularity of Lace Wars amongst Imagin-Nation gamers in particular, I shouldn't have been surprised at the degree of support for the continued use of full dress in the field, even against modern rifles. I imagine just such letters to the editor as the 19th C turned to the 20th. Duly noted. "Hallo young George, come up for the races have you? Well, I suppose I should be calling you Lieutenant Zinn now shouldn't I? congratulations on graduating young man. and smartly turned out too. What's this nonsense in the papers about this so called service dress? Why, when your daddy and I campaigned in the Origawn Territory, we did so with boots properly blacked and brass shining. No batman worth his salt would have let it be otherwise." Oberhilse c1904. LtoR, Full Dress, 1890's service dress with simplified tunic and canvas leggings, belts and helmet cover, proposed olive drab field uniform and proposed field grey uniform. I have a hankering to use my Meisterzinn 1900 Prussians straight up for a change. The upcoming Colonial campaigns seem to be my best bet and I thought that perhaps just painting them field-grey would work and give me dual purpose WWI Germans. Unfortunately, they don't look much like Oberhilse troops to me, they just look like WWI Germans. Reminding myself that this project was not to tied to historical uniforms with resale value as long as it remained largely home cast, I decided to delve into some possibilities. A head swap always remains an option but I want to avoid it if possible. So, I painted 2 new samples, an olive drab version with canvas leggings and helmet cover, and a simplified blue tunic with the traditional light blue pants but with canvas leggings and a helmet cover. The presumption is that the progression went from the flashy full dress to a modified version then to a drab uniform of one sort or another. A broad brimmed hat is also worn by some units. And yes there is a certain resemblance to an historical uniform. So what do I select form the upcoming campaign. I have my favorite but the floor is open for opinions. I had the pleasure today of having the Single Handed Admiral drop by (virtually) for a game. (see his blog for his view of the battle with screen snap shots) Its been about 12 years give or take a few since our last game which was also a MacDuff game now that I think about it but it didn't feel that long as we got going. Instead of dice, Peter took the whole modern thing a bit farther and used virtual dice on an i-something. Seemed rather random to me, about as randomn as my old fashioned cubes. 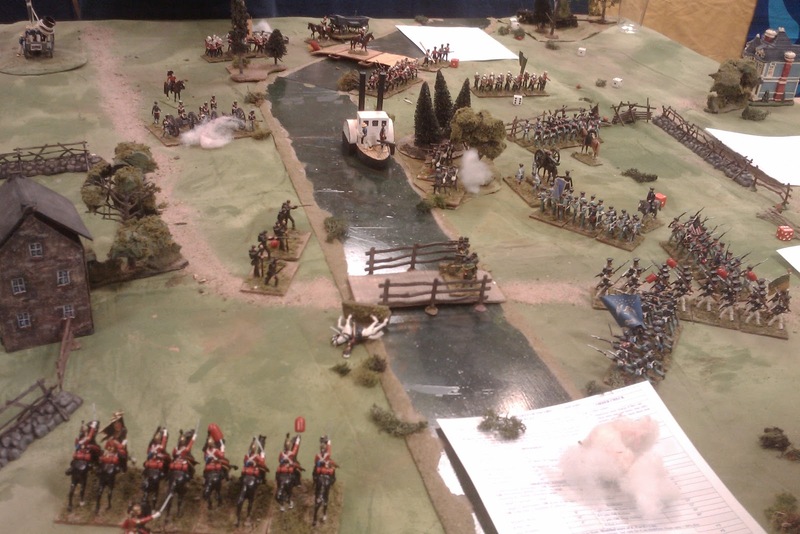 The scenario was inspired by the American raid at Frenchman's Creek in November of 1812. Their goal was to seize and hold a shore battery and to demolish a bridge over which British reinforcements were expected. Peter commanded the Americans while Hector (or see my header picture) commanded the British defence. As British player, his clever plan as explained to me was to have his troops out shoot and out melee the Americans while rolling low and bringing on his reinforcements as early as possible. Unfortunately, making this plan wore him out and he slept through the battle until the tardily approaching Indians woke him and, after looking around to see how things were going, (just the opposite of his plan) wandered off in disgust leaving me to pick up the pieces. The York Volunteers, unable to hold the recaptured redoubt by themselves, cover the retreat of the British Regulars. I did my best, storming forward to recapture the bridge which was one axe stroke away from collapse. This brought Peter down from a Complete Victory to a Clear Victory as he had taken and firmly held the gun battery and had pretty much driven the reinforcements on that side back into the fort just a mile off table. Since he outnumbered my remaining troops by close to 2:1, there didn't seem to be any chance of my driving him off before the guns were spiked if at all. It was more a question of whether or not the British should finish demolishing the bridge! The Tardy but ferocious Grenadiers of the 41st recapture the badly damaged bridge. This was a small, fairly simple game but with single figures and scattered companies rather than the big blocks of a Rough Wooing game. It took us somewhere around 2 hours as far as I can tell to play around 8 or 9 turns and I had a good time. Hopefully it won't be 10 years before our next game. This was the first outing for the revised MacDuff and over all I was well pleased. There was one main glitch, while cleaning up the draft I had accidently deleted the evade option and had removed the ability to fire and move for reasons that I can't remember. I restored both these things as the game went on. I also had trouble finding some of the rules and found the engaged penalty not quite steep enough. These things have all been addressed and a new draft uploaded. Something lost and something gained. As we played, I couldn't help but think back to the days when we checked for company officer casualties, and took company officer personalities into account when taking control checks, used variable moves, a number of fire and move options and all sorts of other things and lots of fixed ways of doing minor things. The days when it was hard to finish a game in the time available. In some ways I miss some of those things but on the whole I prefer the clearer, simpler game which allowed more focus on the plan and allowed us to finish. I'm still not sure about Oberhilse and Faraway's next campaign but MacDuff will remain the rules of choice for my War of 1812 games. Washers work. This was my first chance to try the single figures on the canvas table covering. The washers worked great as did the Scruby figures on 15x22mm bases. The S&S figures on smaller single bases were a bit awkward due to their weight and off balance poses, (each weighs 1 ounce while the Scrubies are a little less than an ounce and are balanced.). Over all this level of game worked well with single figures. I'll leave the washers for now but future Scrubies and homecasts will be mounted on 15mm wide flexible steel oval-ish bases and mounted on single company trays, 3 companies to a battalion giving a battalion frontage of under 8 inches, equal to musket range. Well, that wraps up a good day. I'm not in a tearing rush to get a "turn of the previous century" game on the table. I have lots of bits and bobs to work on for other projects and I'm over due with various yard and garden chores. But I figured it wouldn't hurt to source a few things and narrow down the time frame. After leaning briefly close to WWI, I`ve been leaning back towards late 19thC or very early 20thC. I did managed to confirm that a Lithograph of a Boer War 4 wheeled, gas powered, 1 man, motor machine gun vehicle was real not an imagining of the artist and sorted a few things but when I started trying to figure out when gun shields were introduced, I've hit an "uhoh". I really like the look of Boer Ware era field guns but one of the secret attractions of the period is that I would finally have a period and scale that fits the old Crescent 18pdr that's been around since before I can remember. Well, thinks I, surely the one must have taken awhile for one to replace the other. After all, it took decades for rifled breechloaders to replace muzzle loaders and there were still upgunned WWII tanks (Centurions) in service with the Canadian Army when I joined the services in the early '70's. Well, I was sort of right, apparently there was 1 battery of unmodified 15 pdrs used in East Africa during WWI, just one, in the whole world. The gun shield is a very visible mark of difference between late 19thC and 20thC artillery. It was also an insignificant one. I'm just not a very technical guy so my brain tends to doze off when I start reading stats and the brain flips a switch and routes these things onto a bypass so while I knew that the French 75 had a reputation for rapid fire and knew vaguely that WWI guns had recoil absorbers above or below the barrel, I never really thought about it. The key development was of course the introduction of a recoil absorption mechanism when the famous French 75 was introduced in 1898. There were other developments but this was the key one that allowed a field gun to fire faster than a bolt action rifle. It was such an important development that all nations who could, adopted new field guns and modified existing ones while they were waiting. Alas (for me) it appears to have been a relatively quick and easy adaptation and it totally changed the look of the guns. So, even assuming that Oberhilse and the rest can't afford the latest and greatest, I appear to have a fairly narrow window for mixing the two styles of gun and need to deal with one being about twice as effective as the other. There is another problem. While I can probably track down enough Crescent 18 pdrs for my WW1 needs and Berlin Zinnfiguren has Shieldkrot`s 77mm FK96, no one seems to make a 1/43rd Boer War vintage 15 pdr BL or a 75 or 77mm Krupp Bl or anything even remotely looking like either. I really don't want to teach myself to make gun carriages and turn barrels on a make shift lathe. 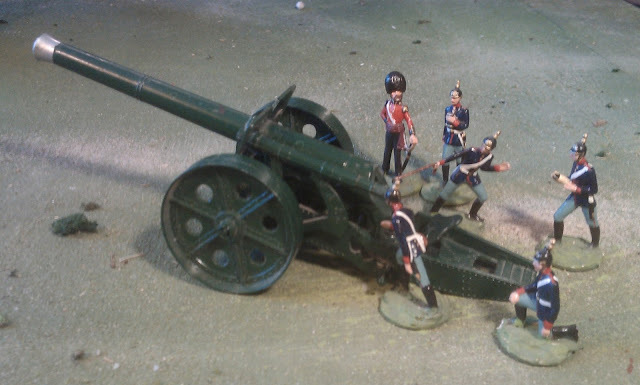 So far, about the closest offering that I`ve seen so far would be a S&S ACW 3" ordinance rifle for the 15 pdr or a 10lb Parrott for the Krupp, and that only because I have no eye for detail on machines but who is to say that surplus American artillery didn't find its way to Atlantica? Especially if I want to do some 1880's games? Something to think about anyway. I haven't read Courts of the Morning yet but I've flipped through an HTML copy and various summaries and put it aside until I finish Commando! So, too soon to say the details have affected me, but already I have walked further along a path that my subconscious has been trying to open up. Rather than point you back to various posts, I'm just going to reuse some pictures (my on line album is already more than 50% full!) and lay out some thoughts and see how long standing threads come together..
1.I find myself drawn to Times of Transition in military history. The late 19th and early 20th Centuries are one such era when horse and rifle met steam, petrol, wire and machine guns and drab uniforms began to be adopted widely. This is one link between the Boer War, Lawrence, the Russian Civil War, and so on. The political setting of such campaigns may or may not be of interest but is a separate question from the purely military aspects. .
2. I feel a connection and/or interest to my Grandfather's time. Oddly, or not, this is also the late 19th and early 20thC. I also like the look of glossy toy soldiers from that era. So did he. 3. Rebellion against what is perceived as External Authority draws me. Again, the politics and questions of right and wrong of either side are separate questions. It is the idea of armed citizens standing up to professional (in the very broadest of terms) armies. The period or authenticity of view points isn't all that important either, so Botha, Bowie, Boadicea, Braveheart (sic), they all tick this box as do many others. For me this resistance to external power is one of the attractions of classical Colonial wargames and the Boer War in particular. 4. A mold in the hand is worth 2 OOP molds in someone else's hands. I thought briefly of shelving this project until Mike had the old Scruby Colonial molds ready, after all, you can't do the Boer War without any British and if I made my own, where would the incentive be to buy the Scrubies, if/when they come out? 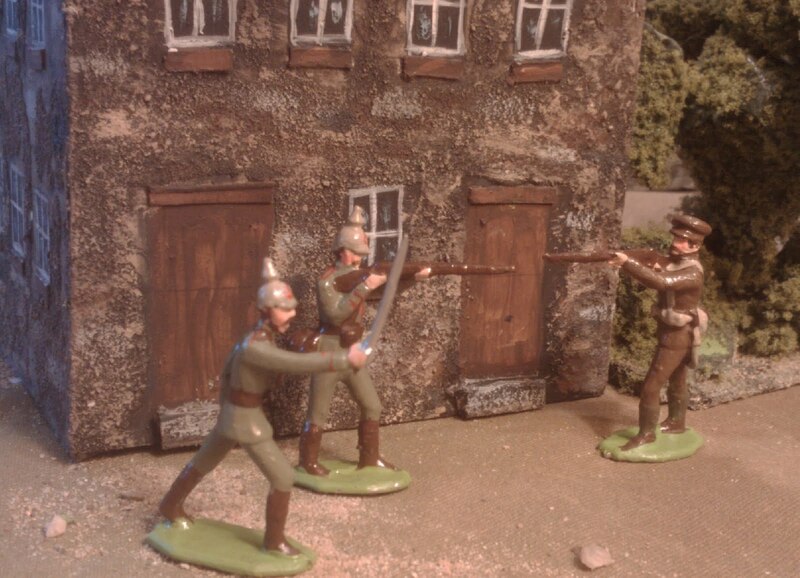 In the meantime I hauled out a couple of my homecast Zinnbrigade c1900 Prussians (sic). It occurred to me that I could start there and fit them in somewhere. 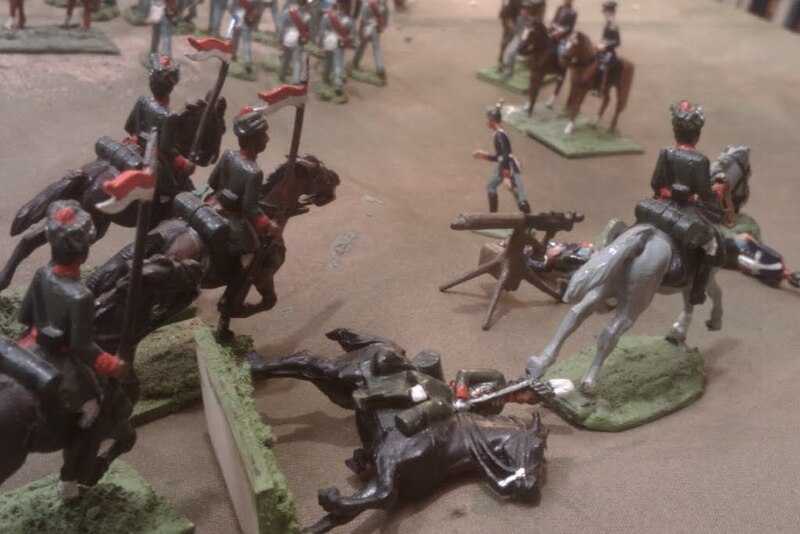 I then hauled out my Frontier Light Horse and once again thought that the Scruby Confederate cavalry in slouch hats with rifles would make good Boers. But where to fit the picklehaubes in, State Police perhaps? 5. My Standard Size (ie small 54mm) Britain's WWI machine guns caught my eye, reminding my of their last use. unfortunately, they just look too big for machine guns for the 40mm figures. I wondered what weapon might look like a big MG.
Then I wondered what Pom Pom guns looked like? Wikipedia? Ahhh, OK.
Boer and Australian Pom Pom guns From Wikipedia. Look like big Maxim guns on wheels to me. 5. Countries of the Imagination are only as narrow as you make them. It was in the middle of all this that Bob Cordery pointed me towards The Courts of the Morning. The first temptation for me is always to do a vaguely historical recreation of a campaign or campaigns that catch my eye, However, translated into a fictional setting, I see that I could weave a rich background like a novelist and incorporate most or all of the aspects that attract me while exercising my imagination. The blank canvas of North Atlantica is wide open. 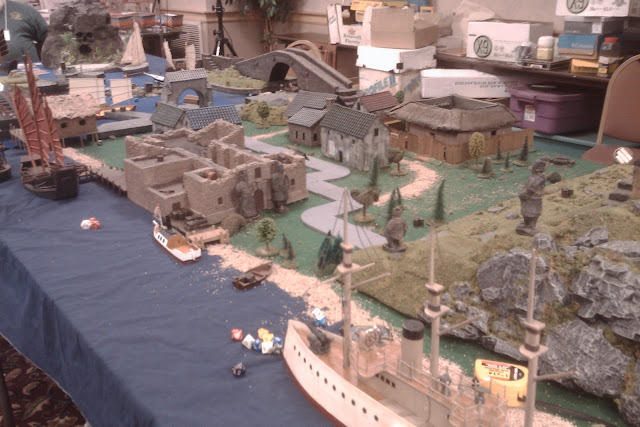 As I looked again at the figures on the table, various bits of already established Atlantican History began to fold together and I began to shift my thoughts about where to start. I will paint up some British troops but there is no reason that I have to start with them. Oberhilsian expansion North of the Mountains would be unlikely to be able to avoid conflict with the free settlements of Moose Jager and Natives in this area, pushing them to coalesce behind a great leader and fight for an Independent State. Exactly where Faraway and the British (whose presence in the 1860's is already attested) fit in, remains to be determined. 2) Sketch the history from 1850 to 1910 and come up with names of places and people. Especially attention to the Brethren, the Moose Jager, the various native tribes and Metis or mixed blood societies and Oberhilsian expansion and the role of the FTC North of the Mountains. 3) Pick an opening scenario and establish an OB for both sides. 4) Cast up an Oberhilse army and paint them straight out of the Zinnbrigade Prussian molds but in drab/field grey. Infantry, Cavalry, and gunners. Obtain or build appropriate artillery and transport, wagons or train. 5) Assemble opposing "native"/"rebel" forces from conversions of homecast molds, original figures and more Scruby Confederates. Forces to be smallish units of free standing single toy soldiers. Possibly uisng Asquith's Big Wars but more likely I'll pick up on the idea of an expansion of With MacDuff To The Frontier into the early 20thC. Early this year, I had put MacDuff on hold while I tried to sort things out for my Aroostock game at Huzzah. That has now come and gone. Looking at the Colonial games at Huzzah made me a bit nostalgic so with a War of 1812 Skype gaming tentatively scheduled for Monday, and with lots of thinking under my hat, I decided to pick it up again. There were a couple of things about the previous draft that I wasn't happy with. One is that while I liked the 2 hits on a 6, I didn't like the way that it created some "gotchas" in the application of modifiers. The original rules used a mix of die modifiers for range and half casualties for cover etc. In an attempt to use one or the other, I had moved to all modifiers. I am now trying all 1/2ing and modifying numbers of dice in a few select instances. This should allow the 6 to do what it should. The other main thing was that the morale rules were getting more cumbersome and less effective. The answer to this was to find yet another slightly different way to apply the original rules. Now the retreat for units which have fallen below 50% will take place immediately. All units on both sides may rally at the end of each turn. Any unit still below 50% after the rally rolls will be removed. Hopefully this and various other minor changes and clarifications will work as they reflect some key decisons. I always wanted the game to be simple and fast and while the mechanisms have been individually so, the aggregate has not always been so in practice, especially for players unfamiliar with the rules. The choice has always been between added granularity and practicability especially in convention games. I have noticed over the years that rules that appealed to me as framed sometimes ended up being rules that I ignored when playing solo or running a club or convention game, usually a good sign that they should be replaced. Solutions to things I'm not happy with in practice usually involve choosing between priorities and trying different approaches to achieve the same goal. An occasional revision of opinion on the history being represented has also had an impact from time to time which is a different thing. I have also made yet another attempt to make the rules easy to read and clear to apply, putting important bits in what seem like the right places, rewording things and so forth and catching the occasional accidental deletions like risk to generals which had gone AWOL. The new draft has been loaded onto google docs and a link can be found at the left. Now I need to eat some of the MacDuff pudding. OK then the Boer War, Boers hiding in trenches, being shelled ineffectively while shooting down the gunners and pinning down long lines of Brits who have to get close enough to stab people to do damage... well, no, I wasn't thinking of that Boer War, I was thinking of the one that appears elsewhere in older wargaming books, agile mounted parties of Boers with guns, ambushes and surprises on both sides, lots of shooting, lots of maneuver. It is the war that appears in memoirs, in the old Baden-Powell cartoon strip in the scouting magazine I got in my teens, (the same magazine where the article on wargames and home casting appeared) and in some accounts of the Canadian contingents that I have read. Largely it is the war after the fall of Pretoria though it does appears here and there earlier on but is usually dismissed by books that focus on the Big Battles of 1899 and on Black Week in particular. 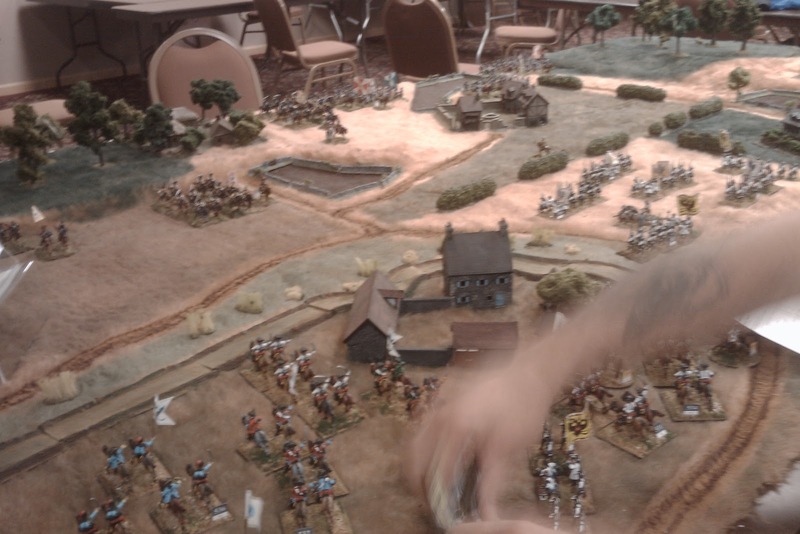 This is a game that needs to combine large distances with small parties of men fighting dispersed, all on a small table top with relatively few figures. It is definitely not a game where constant scale will make sense, unless perhaps, if you are playing outside. There are some very interesting and relevant rules ideas to be found in some of the earliest rules (Just tucking into John Curry's invaluable Wargaming Pioneers, more on that book in a later post, perhaps.) But the more I get back into this, the more it looks like an opportunity to scratch several vague long term itches. In other words rather than trying to "accurately" reproduce any one of a number of historical engagements and campaigns where we know what actually happened, this is a good opportunity to draw inspiration from the Metis Rebllions, The Boer Wars, the Arab Revolt, the Senussi and more for a fresh story in a fictional background. Something from the early 20thC history of North Atlantica. Some aspects of supply and maneuver could be relegated to campaign maps but I don't want to just play a later version of With MacDuff with rifle range stretching 1/2 way across the table. A Portable or Frontier Wargame approach is attractive and has not yet been declined but since the game will be set at the Turn of the Century, contemporary with Wells and other early wargames, the use of single toy soldiers is attractive. I don't want to mow down the abandoned bit of hayfield across the brook, so, something more Big Wars that Little Wars I think. A slow drain of casualties does have an effect and units can eventually break. This could be done by removing figures or by using a roster or similar. The firing power of a unit doesn't seem to diminish in proportion to casualties or rather casualties rarely reach above 20%-30% so the rate at which morale would be effected does not have a 1:1 relationship with casualties. Units sometimes withdraw voluntarily r may retire with out being destroyed. This all brings the Battlecry stable to mind. Rietz talks about how deadly the British fire was, especially up close which rather speaks against one stereotype though he is confident that the Boer fire was even more deadly which reinforces that one. He also distinguishes between ranges, very long one range being too far for accurate shooting though not for effective pinning. At short range, the marksmanship of the Boers really comes into play. This all tends to match some of the handful of Canadian accounts I've read. Rietz also reinforces the stereotypes about bayonet charges and how effective they were and how hard it was to get men to stand. If they did stand and weren't able to stop the British from closing the results were usually decisive. Even if the Boers managed to ride away, if chased by cavalry, it might be hours or days before they regrouped. So charges can destroy units. Cover makes huge difference. Even slight cover helps slow permanent losses but does not lessen pins. Hard cover as in trenches and gullies or rocky hills can reduce casualties still more but getting troops to advance out of cover is hard. Shooting mechanism. This all seems to call for good old fashioned 1 die to hit based on range with a hit causing a pin, another roll for each hit to convert the pin to a loss with modifers for cover and range. Distances. Given a 5x6 table, I think Big War ish ranges so 12" for modern rifles only divided into short and long to avoid excessive picky-ness. Guns reaching out 2 or 3 times that depending on weight. Movement should be generous, perhaps 12" in the open for infantry, 18" for cavalry BUT subject to opportunity fire which will tend to stop it. Probably more than enough random musings for one day. 2012 After the convention.New Projects. Old Issues. There is often a quiet space, a vacuum almost, after a long planned game has been staged at a convention. This has been an especially odd one, the game was conceived and 75% done 3-4 years ago, a plausible Historical semi-skirmish game. Then I changed my mind on what I was doing, several times, and then had to scramble to present something. Well, that is done and while my 40mm Toy Soldiers remain my main "thing", I'm going to give them a breathing space while I spend time and grey cells "collating data like they say". In the mean time, I want to do some renovating and reorganizing, not to mention cleaning up of my games room and I'll keep puttering away at 25mm Ancients, 1/72nd ACW. But, two new projects have been approved by The Internal Committee on Wargaming, one French Revolution/Egyptian Campaign, the other Boer War related. After a debate on size and scope and consideration of 10mm, 1/72nd, 25mm and 40mm scales, the Committee has selected 40mm as the size for both of these new campaigns in keeping with Standing Orders. But what sort of 40mm and what sort of game? When the always lurking lure of the French Revolution surfaced again, it didn't take long to remember that Rob already has a Scarlet Pimpernal game. Even though I want to do Egypt, there could be substantial overlapping uses for figures in both directions, or I could just add a few opposing units if I am willing to persuade myself that this would not contravene Article 64 that says no duplication of projects once one is sold off. (In this case my various 15mm FRW war armies). There is a lot to be said for shared projects, especially when shared with someone close by but even at a distance. The Rough Wooing games played at Huzzah can only be considered an example of a successful shared project. It has been well received at various conventions, the original Relief of Haddington game gathering an Award as well as being over stocked with players despite 3 runnings of the game, but has also continued to be played and added to since then. Solo and 2 player games on both ends, and various returns to conventions at a smaller, more casual basis than the first outing. There are generally 4 key "what's" to starting a shared project: "What campaign(s), What rules, What figures? What basing?". Luckily Rob & I agreed fairly smoothly on these including possible expansions and rules, despite difficulties being able to playtest these in the first decade after the inception of the project. That was a matter of detail only, none of the essentials have changed and the door is still open to new fronts, new convention and home battles in years to come. The only fly in the ointment for the French Revolution is that once again, Rob's figures are all (or 98%) Meisterzinn figures, 45mm tall and chunky. The Scrubies, Elastolin and Zinnbrigade that I hope to use are 40mm and slender. Not a comfortable mix. We actually hit the same issue last time but I only had a handful of Elastolins so I tend to just leave them home apart from a few individuals mixed in here and there where they just add natural variation as opposed to whole battalions of midgets and giants. Left to Right: Scruby 1812 Britsh, Britain's original Standard size Highlander, Meisterzinn figure converted to a F&IW Highlander, Scruby again, Elastolin Turk. To me the Meisterzinn looks more comfortable with the old style 54mm than he does with the Elastolin/Scruby version of 40mm. Next: The Boer War, 18 pdrs, Zinn Brigade, Field Grey, Metis, and Atlantica's Moose-Hunter culture and the old history vs fiction, element vs single toy solider debate.. Here I am, Home from Huzzah! Lets kill any suspense right off the top and say that I think the organizers did a great job and I greatly enjoyed my weekend. As much as I enjoy Cold Wars and Historicon, I sometimes find the smaller shows more enjoyable, less fuss and bother, easier to see all or at least most of what's going on and generally enough games and well stocked dealer tables to make it easy to spend money. The hotel chosen was easy to get to, easy to get around, and while not overly fancy, was more than reasonably priced with the convention discount and suited me to a tee, they provided great service, including cookies that were both good and free. They were also within easy walking distance of alternate eating places if you didn't like the menu. I would cheerfully go to any future Huzzah that I can manage. SWMBO and Warchest willing. On a related note it was really great to meet some blog readers in person and even have a few join into games. Great gentlemen gamers that would be welcome at my table any time. One of the theme Boxer Rebellion games caught between rounds. I think the Major General would have approved. Hopefully some one will write a marvelous report with lots of pictures, my camera remained buried in a bag and I only took a few cell snaps. There seemed to be a good mix of popular games and (I'm trying to think of a neutral term here to avoid appearing to diss popular things which many people enjoy) lets say more personal approaches to the hobby. Games on land, in the air and on the sea in just about every scale and every style of rules and many periods. 28mm SYW, Teddy Bear fur and Carnage & Glory. My friends the Deans, Rob and sons Norman and William had driven up from Maryland, Huzzah being almost precisely 1/2 way between us, a 1,000 km from either end, and we started the weekend with an introductory game of Basic Impetus using an old collection of micro-ancients dancing on heads of pins. (Mind you by the end of the game I was able to distinguish (just) cavalry from infantry by leaning close and peering.) Oh, by the way, a warning about the pictures on Rob's and Norman's blog reports, they seem to have photo shopped some ancient hermit or Saxon Thane into where I should be. I didn't exactly fill up all the empty spaces in my car (until I looted my sister's place on the way home) but I did pick up some more Trident 40mm figures to flush out my AR Loyalist rangers, bring my 7 Jaegers up to a more comfortable 8 and so on. The real treat though was a copy of Deneys Reitz's Commando, his experiences as a young Boer during the 2nd Anglo-Boer War. This war has been on my "todo" list since I was knee high to a grasshopper but recently my mind had started to wander towards a 10mm General's eye view of the battle but while I'm not finished, like when I ret de Wet's memoirs and various Canadian accounts, not to mention Churchill, this book is snapping me back to a 40mm toy soldier version of the Boer War, possibly a question of revisiting and extending MacDuff. A poor snap of the magnificent Boxer theme games. Suddenly I missed the old MacDuff games. OK one last distraction, I spent most of the convention parked beside Eureka/AB miniatures. I had been a big fan of Tony Barton since I saw the first ad for 15mm French Revolution in the first WI and they formed the bulk of my 15mm collection after that, bulked out by OG for largely financial reasons, FRW French, Austrians, Russians, Turks, ACW Rebs,....all gone now since I have resigned from 15mm. I was aware of Eureka 28's but this was the first time I'd really seen them in person. What marvelous figures! These are the first 28's I've ever seen and liked. Its not just that they aren't exaggerated its that the sculptor seems to really understand movement, balance, weight etc of people and other beings but also of inanimate things and clothing. I could cheerfully build armies of these, if I was still working and well paid. So like a diabetic standing beside the cake displays in a bakery, I spent my weekend! Friday night saw the Aroostock War heat up, an aggressive American defence almost beat back the Brits but while the British managed to spread their hits around and rally them, the American forces got trapped into concentrated hits with losses of stands and eventually their army's morale cracked. My "boys" watch the on coming Redcoats. The subtle grid corners are just visible. 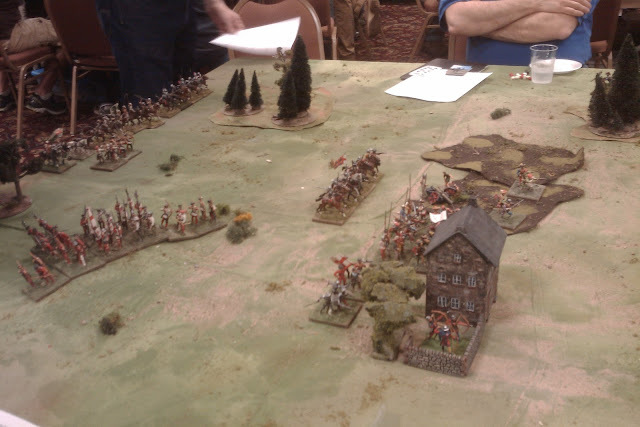 Saturday morning, I played in Chris Parker's 40mm Brandywine game, played on a square grid using a mix of Battlecry with modifications including, I believe, some things borrowed from his own Day of Battle. This means that I finally got to use some of those funny dice with the sabers and flags etc. I really hate to admit this, but, they were fun to use! Over all the game went well, provided a smooth, easy to pick up game which was fun but still seemed to capture the flavour of the period and delivered what felt like a reasonable result in a squeaker of a game. More grist for the thought mill. I like to think having one of my Riflemen pick off Cornwallis, when he appeared at the head of some Grenadiers at about where this picture was taken from, was a factor in the American win. Saturday afternoon and evening saw 2 games of Rough Wooing. The evening one was short handed so Rob and I pitched and played which we don't often get to do and it was a pleasure to play. Neither of these games were as close as the Friday games but since the French won in the morning and the English in the evening, it would seem that Mr. Kinch's scenario from Battle Games stood the test. Sunday morning, ended with a no-show of players so after hanging around a bit, I quickly packed up and hit the road two hours early to my great relief. I hadn't been looking forward to navigating deer and porcupine infested, washed out back roads after dark as I made my way back to her place Sunday night. So a good convention weekend, the planning, preparation is almost done, and the playing is all done, so its time to start looking at the year ahead. More on that in a day or so. Ashley & Amelia, two of my sister's kids. For those who wonder why I'm leaving Tuesday for a game on Friday night when its only 1,000 km to go this year, I'm stopping off 1/2 way for 2 nights with family. Unless I remember how to do mobile posts from my phone, next post in a week. 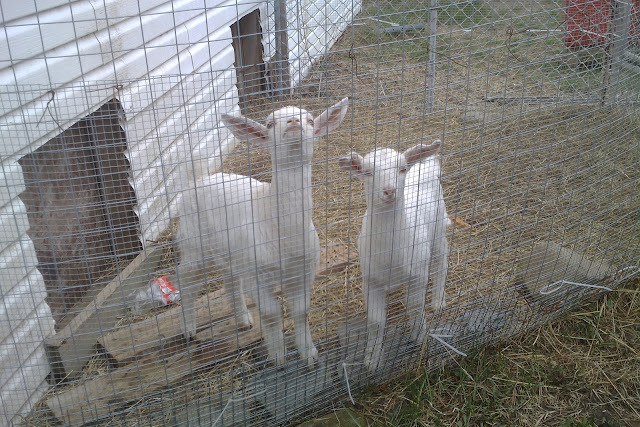 We'll march right down to Port.land.. AND BAaaaACK!